In this endearing, quasi-science-fiction book for older children – and their parents – a young pigeon must grow up fast to fulfill his destiny. The story is told from the point of view of an 800-year-old pigeon named Walter, who is pecking out his life’s story, from his early years living happily with his family in a pigeon coop to his role in saving the world during a natural disaster. Because Walter is remarkably intelligent and descended from a noble line of pigeons, he is able to communicate with humans and birds alike. 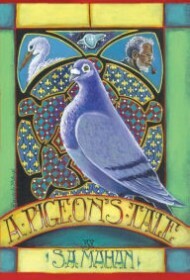 S.A. Mahan fills her book with of memorable characters, including Old Dude, a funny, eccentric pigeon who takes Walter under his wing; Margie, a tough-talking pigeon from New York; and humans, such as Grandpa, who had the foresight to build a space capsule able to withstand the cosmic shift of the planet. The smoothly written story is divided into short chapters and is often funny. Readers will be amused when Old Dude teaches Walter to scrounge for food by following the “little-uns” at a fast food restaurant’s play area because they inevitably drop their food. Or when Margie —who provides hilarious comic relief throughout—shamelessly flirts with a big gray pigeon: “Yo babe, I’m Bruno from Queens,” says the pigeon. “No doubt about it, Handsome!” Margie replies. The story also features many poignant moments, including a main character’s death. A thin veneer of religion overlays the plot (for instance, Grandpa’s granddaughter, fighting cancer, is saved by being plunged into the sacred red waters of life). But even the saddest moments are infused with hope and any serious elements are over-shadowed by the humor permeating the book. Young readers ready to tackle more challenging chapter books or parents who want an engaging story for bedtime will find this a perfect choice. And rest assured: after reading A Pigeon’s Tale, anyone who has ever ignored pigeons at a park or plaza will surely look at these birds in a new light.